Most of my clients are the families who will live in the home. But sometimes a builder asks me to design a home that will sell easily. 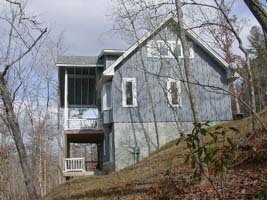 The builder of this home was new to the area, and had no experience with homes on steep properties. 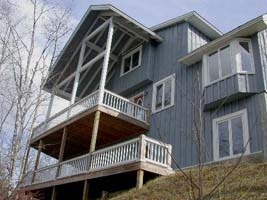 The lot he owned was steep, and I needed to make this home as easy to build as possible. The first step was for me to visit the property. I measured the slope and looked at how we could get a driveway to the house. Then I designed the house to fit these requirements. I designed the home to match the slope. In the photos below you can see that both levels are close to the ground. I don't recommend having a garage in the basement because of the danger of carbon monoxide poisoning, but the builder required this. Another reason I don't like this is the difficulty of bringing groceries in the house. To make this easier, I designed a parking are for the upper level. 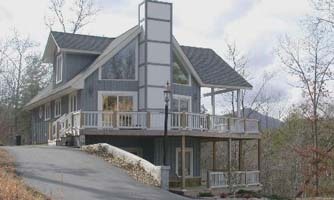 Even though energy efficientcy was not a big concern in the 1990's, I designed this home to be extra efficient. The 6 inch frame walls have R-19 insulation. The entire heating and air conditioning system is inside the house. I even designed a chase for the ductwork to make it very easy to get the ducts to every level of the home. During the construction I asked the air conditioning contractor if any of this made a difference. He told me that these ideas had other benefits I had not considered. The duct chase allowed a much more efficient flow of air, reducing the size of the blower. A smaller blower costs less money and uses less electricity. My design also reduced the labor for installing the heating and air conditioning system. The construction savings in the air conditioning system and the excavation of the site added up to more than my fee. What about the goal of making this home easy to sell? It sold before the construction was done. I designed several other homes for this builder, including his personal residence.